Join Uniden in celebrating their golden 50th Anniversary! Uniden is proud to present the all new PC78LTD Limited Edition Professional CB Radio with SWR meter! As part of the 50th anniversary celebration Uniden has reintroduced the high-cut filter switch to the limited edition series of CB radios! This most often customer requested feature is back by popular demand! You asked for the high-cut filter and Uniden has responded. The PC78LTD is elegantly styled with a flat black case, chrome controls with positive feel, and easy to read display. 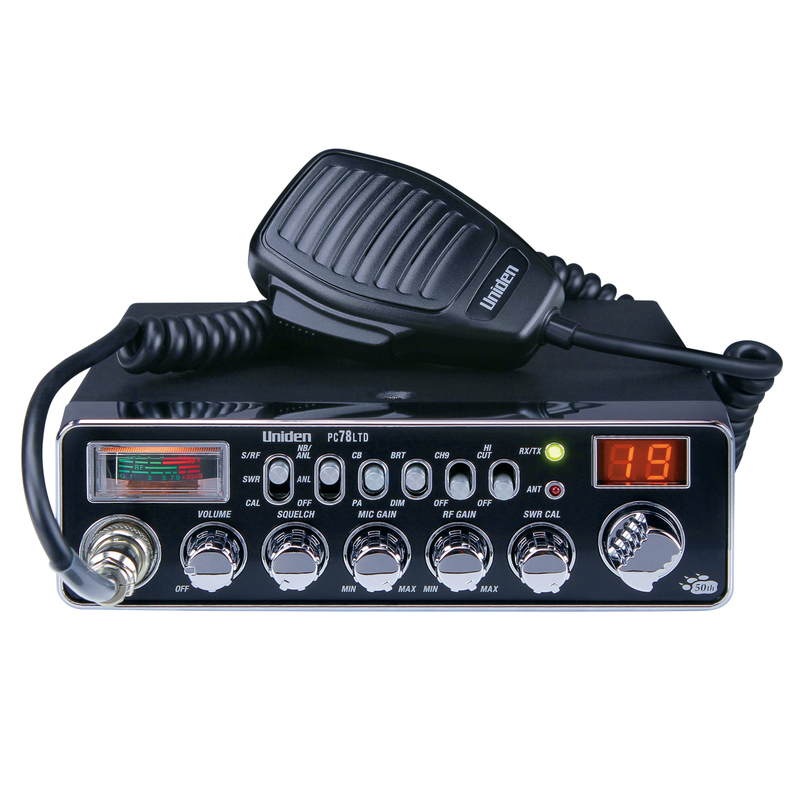 The Uniden PC78LTD is the latest limited edition 50th anniversary 40 channel mobile CB radio. The PC78LTD features an SWR meter for simplified antenna tuning, Classic Uniden styling, extended microphone cable for ease of use, Noise blanker, auto-noise limiter. The PC78LTD brings back the high-cut filter for enhanced audio. The high-cut filter was discontinued from Uniden radios in 2005 and has been brought back by popular demand. Uniden's front panel mic connector, instant channel 9, PA/CB switch, RF gain, and Mic gain controls round out the 50th anniversary limited edition feature set of the PC78LTD. This Uniden is loaded for the road. Once your antenna system and radio is installed, power on your radio, flip the switch on the radio to "CAL" (next to the meter), put it on channel 40, key the mic (and keep it keyed), turn the "SWR CAL" knob until the needle on the meter moves directly to the CAL mark on the meter, flip the switch on the radio to "SWR" (next to the meter) and write down the SWR reading on the meter. Complete the same exact steps for channel one. Once you have the readings, you can use the information in our SWR article to help you understand what they mean and what you might need to do to tune the antenna (lengthen or shorten) and troubleshoot high SWR.